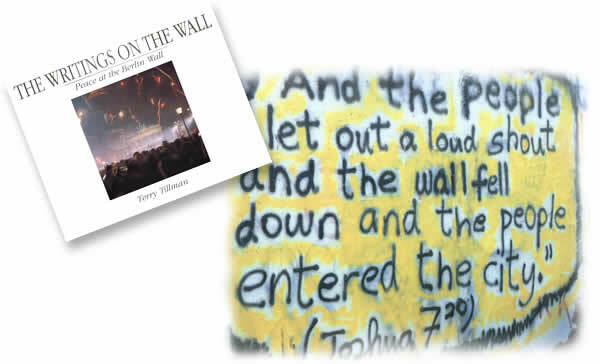 This remarkable book communicates in word and picture the harsh reality that was the Berlin Wall and the historical circumstances that saw it changed from a bitter symbol of a divided world to a hopeful sign of peace. But it is about more than the Wall and its graffiti. It is about the walls in our daily lives, how these add up to a fragmented world, and how, bit by bit (peace by peace? ), we can free our world. It is witness to a consciousness change from division and separation to unity, oneness, and human caring. It's about the family of man. And it is a record of the demonstration of the very real possibility of individual and world peace. The writing's on the wall. This book is deeply moving because it is about freedom...The Writings on the Wall has done the impossible, giving the reader the uncanny feeling of actually being in Berlin as the historic event unrolled. I was moved to tears. The juxtaposition of photographs and quotations told a magnificent story of the human spirit... The Writings on the Wall, in my view, is more than a book. It is a perpetual flame. It is a guiding myth, a story with a compelling cast of characters: citizens, soldiers, politicians, numberless and nameless artists and poets, mourners and celebrants. Like the rainbow in the story of Noah and the flood, the dismantling of the Berlin Wall is a promise and a reminder of grace.